Trans-umbilical breast augmentation (T.U.B.A) is now a well-established technique and is used by many surgeons and chosen by many clients. There are several Plastic Surgeons offering this technique in Cleveland, Lyndhurst, OH. 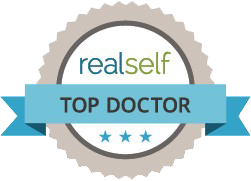 Dr. Green has also attended several courses on this technique at national Plastic Surgery meetings. The technique has several limitations however. The approach allows only blunt dissection and blind dissection of the pockets for the implants. A standard part of sub-muscular placement of implants involves partial transection of the pectoralis muscle. This is very difficult to do neatly and efficiently from below, through the bellybutton. Plastic surgeons that use this technique say that they are able to divide the muscle by tearing it with special instrumentation. Dr. Green has not been convinced that this is as effective as the trans-axillary approach with direct visualization of the muscle with the endoscope, and division with electrocautery. Dr. Green therefore prefers the transaxillary approach and does not generally offer the T.U.B.A. technique. Also the T.U.B.A technique cannot be used for the new silicone gel implants. These require a direct inframammary incision to place them effectively because they come pre-filled and cannot be passed through a small opening. For most clients requesting Breast Augmentation, Dr. Green prefers silicone implants placed through the axilla (armpit) via a relatively new device called the Keller Funnel. This provides a very inconspicuous scar at the incision site which is remote from the breast. It also allows very effective placement of the implant in the sub-muscular plane with accurate partial division of the pectoralis muscle. T.U.B.A. remains an alternative, for those who prefer this approach. Dr. Rodney Green is a board-certified plastic surgeon and has been serving the greater Cleveland and surrounding areas for the past 20 years. In addition to his special training and plastic surgery he has additional qualification in Hand Surgery and has a special interest in endoscopic carpal tunnel release.